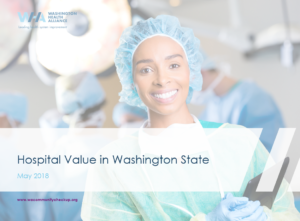 SEATTLE, May 22, 2018 – The Washington Health Alliance today released the first report in the state to publicly combine scores on quality, patient experience, and cost for Washington hospitals. Ranking these three elements allows the public and health care stakeholders to view the extraordinary pattern of variation in hospital value across Washington state. The Hospital Value Report ranks 48 hospitals in Washington and challenges the popular belief that higher prices always translate into better care and outcomes. The report looked at 13 indicators that measure health care quality, comprised of mortality rates and patient safety indicators, developed by the U.S. Agency for Healthcare Research and Quality (AHRQ). For patient experience, the report uses patient-reported ratings from the most widely used hospital patient experience survey – the Hospital Consumer Assessment of Healthcare Providers and Systems (HCAHPS). And finally, the Alliance uses publicly available, hospital-specific data from the federal Centers for Medicare & Medicaid Services to look at the amount of money each hospital charged for the services they provided to Medicare beneficiaries for inpatient stays (FY 2015). Known as gross charges (or list prices), these are a hospital’s official price for every billable item and service provided to patients, prior to considering insurance coverage, which typically includes negotiated discounts for public and private insurers. The online “Highlight” of the report allows users to compare any two hospitals in the report on quality, patient experience, and cost. Consumers should be aware that the costs factored into the report do not take into account their individual medical insurance and benefits, so they should still check with their health plan or provider prior to deciding on where to go for care.